Welcome to the latest edition of the HP Discover Performance Podcast Series. Our next discussion examines how TTNET, the largest internet service provider in Turkey, with six million subscribers, significantly improved applications deployment while cutting costs and time to delivery. Gardner: What was the situation there before you became more automated, before you started to use more software tools? Yükselten: We're the leading ISP in Turkey. We deploy more than 200 applications per year, and we have to provide better and faster services to our customers every week, every month. Before HP SV, we had to use the other test infrastructures in our test cases. We mostly had problems on issues such as the accessibility, authorization, downtime, and private data for reaching the other third-party’s infrastructures. So, we needed virtualization on our test systems, and we needed automation for getting fast deployment to make the release time shorter. And of course, we needed to reduce our cost. So, we decided to solve the problems by implementing SV. Gardner: How did you move from where you were to where you wanted to be? Gardner: Give me a sense of the type of applications we’re talking about. Gardner: Let's talk a bit about the adoption of SV. What you actually have in place so far? HP Software helped us so much, especially R&D. HP Turkey helped us, because we were also using application lifecycle management (ALM) tools before SV. We were using QTP LoadRunners, Quality Center, etc., so we had a good relation with HP Software. Gardner: My understanding is that you have something on the order of 150 services. You use 50 regularly, but you're able to then spin up and use others on a more ad-hoc basis. Why is it important for you to have that kind of flexibility and agility? Yükselten: We virtualized more than 150 services, but we use 48 of them actively. We use these portions of the service because we virtualized our third-party infrastructures for our needs. For example, we virtualized all the other CRM systems, but we don’t need all of them. In gateway remote, you can simulate all the other web services totally. So, we virtualized all the web services, but we use just what we need in our test cases. In three months we got the investment back actually, maybe shorter than three months. It could have been two and half months. For example, for the campaign test cases, we gained 100 percent of efficiency. Before HP, we could run just seven campaigns in a month, but after HP, we managed to run 14 campaigns in a month. Gardner: Do you expect now to be able to take this to a larger set of applications across Türk Telekom? Gardner: Well, it's really impressive. It sounds as if you put in place the technologies that will allow you to move very rapidly, to even a larger payback. So congratulations on that. Gain more insights and information on the best of IT Performance Management at www.hp.com/go/discoverperformance. 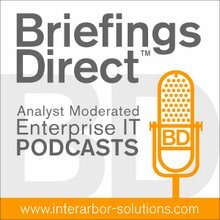 And you can always access this and other episodes in our HP Discover performance podcast series on iTunes under BriefingsDirect.